Both cancer patients and survivors are having new fears — anxieties that equates to the trepidation they had when first diagnosed with the disease. According to a recent story by Laurie McKinley in The Washington Post, what they're afraid of is the Republican obsession to dismantle the Affordable Care Act, otherwise known as Obamacare. The McKinley piece says those patients and survivors "are among the most vocal of groups raising alarms about the GOP's repeal effort. They are calling congressional offices and showing up at their representatives' town hall meetings with angst-filled stories about a pre-ACA world in which they couldn't get individual health plans because of their medical histories." More than 15 million people in the United States are patients or survivors, the story adds, "with millions more affected as family members." McKinley writes that "many people described a kind of existential dread that matches their fear of cancer," still the second-leading cause of death in this country. 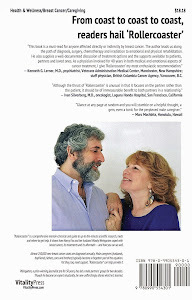 In effect, they fear a return to the "medical dark ages" where their disease is concerned. "Some worry," the story continues, "that the law's likely dismantling may put the latest oncology treatments, which can run $10,000 a month, out of reach. Others point to research showing that insurance status affects cancer patients' survival." The piece also quotes Dr. J. Leonard Lichtenfeld, deputy chief medical officer of the American Cancer Society, as telling a recent House committee hearing, "Cancer patients need to know that they have insurance." 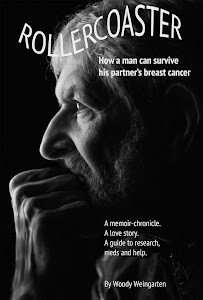 Fear, and how to overcome it, is a major topic of "Rollercoaster: How a man can survive his partner's breast cancer," a VitalityPress book I, Woody Weingarten, aimed at male caregivers.